When Judit Gyorgyey Ries was in the 6th grade in Hungary, she read a book about astronomy whose title is roughly translated as Tales of the Moon. It was this book that made her "totally fall in love with astronomy." Once she was hooked, she charted a course for her future that allowed her to study her new favorite subject. She received her Masters degree in Physics Education and Astronomy from Eotvos Lorand University in Budapest. When she was 25 years old, she came to the University of Texas where she earned a Masters degree in aerospace engineering, and later a Ph.D. in astronomy. She is currently a Research Engineer/Science Associate in the astronomy department at the University of Texas. Judit came to Texas from Hungary, where she grew up. While she did speak English when she arrived here, there were still many new words and cultural nuances that she had to get used to. "Funny things like the word â€˜deductable' didn't mean anything to me," she says, "because it was a totally different system." She adjusted quickly, however, and later married an American and settled in Austin. Her husband is an aerospace engineer at UT. "When you turn, those skirts fly!" Upon arriving in the United States, Judit found out about a Hungarian dance group that needed a translator for the non-English speaking instructor. She volunteered to help, and has been involved with Hungarian folk dancing ever since. The group Judit performs with, which includes people of Hungarian, Japanese, Taiwanese, American, and Belgian descent, has been invited to dance at international dance festivals in the United States and in Hungary. The dancers' costumes are all specially made. The dresses that Judit and the other women get to wear have very full skirts and petticoats so that "when you turn, those skirts fly!" It's an aerobic activity that's very enjoyable for all involved, she says. "You need to catch it again." In her astronomical work, Judit studies Near Earth Asteroids. 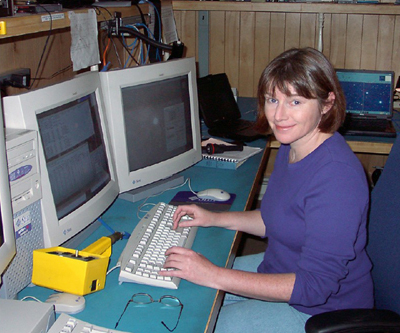 She spends her time at the telescope looking for new asteroids and following up on new observations from other observatories. If a new object is found, it is very important to observe it again soon. "You need to catch it again close to the discovery," she says, so that astronomers can calculate its precise orbit. Staying up late at the telescope has never been a problem for Judit, who is a self-described night-owl. She loves to stargaze at McDonald Observatory, and she has even seen the Aurora Borealis from there. (It is unusual to see these so-called "Northern Lights" from such a far southern location.) An added bonus to Judit's work is that she's helping to keep the Earth safe from asteroid impacts. Whether she is watching the skies with a telescope or with her eyes, it is clear that Judit's passion for astronomy has provided her with a lifelong career that's perfect for her.